Contains happy drink (...or two...). Fresh raspberries or strawberries, to serve. To make the panna cotta, scrape the vanilla seeds into the cream (or add the vanilla extract) and gently bring to the boil in a saucepan. Immediately remove from the heat and sprinkle over the gelatine, stirring briskly until the gelatine has completely dissolved. Allow the cream to cool slightly, then add the Baileys and food coloring and stir well. Lightly greased 4 ramekins (or cups, or jars) and pour in the mixture. Keep Panna Cotta in the refrigerator for at least 1 hour or until set. To make the mocha ganache, melt the chocolate in a double boiler over medium heat. Add cream and coffee gradually, keep stirring gently until the ganache is smooth. Allow the ganache to cool slightly, and pour a layer of ganache on top of each Panna Cotta, carefully trying to smooth it out evenly across the top. 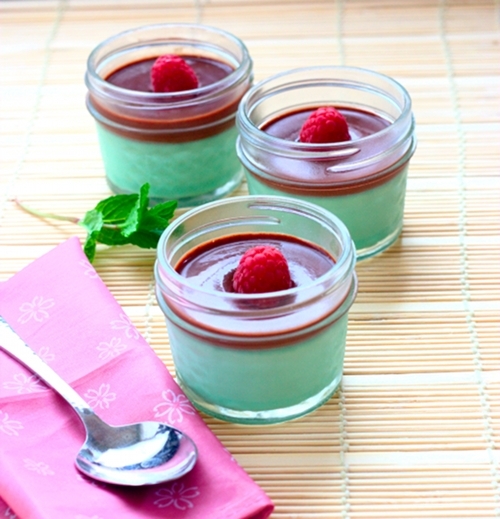 Return Panna Cotta to the refrigerator for another 1 hour, to allow the ganache to firm up, before serving. Top with fresh raspberries/strawberries. These panna cotta look absolutely beautiful and I bet they taste as good as they look. Love those respberries on top. I have to make this....It looks absolutely delicious.